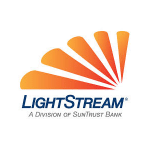 LightStream is a personal loan platform that is a division of SunTrust Bank. They offer personal loans for different categories such as home remodels, weddings, medical needs, and more. In this article, we cover user reviews and fees. Ready to get started with LightStream? Apply now. Users who gave LightStream a positive review like the fast process from application to releasing of funds. They said that LightStream provides great service and customer experience to their clients. One user who gave LightStream a positive review on LendingTree said that his whole loan process was fast, which took only one day — he applied for a loan at 10:30 AM, received the approval at 9:00 AM the next day, and the funds were wired to his account by 2:00 PM the same day. He added that LightStream even called him to make sure that everything was good, which he really appreciates. Users who gave LightStream a negative review complained that their application was rejected despite having a good credit score and high yearly income. Some reviewers also claim that LightStreams sells their clients’ personal information to other companies. One user who gave LightStream a negative review on Super Money said that his application has been denied for the smallest loan they offer even though he has an 800 Equifax credit score, zero balances on any credit cards for over four years, and good income. He also mentioned that LightStream hard pulls people’s credit reports as well. LightStream’s rates depend on the purpose of the loan and the payment terms. Their loans start at $5,000 and max out at $100,000. Their interest rates range from 3.34% to 16.99% per annum. Ready to get started with LightStream? Apply now. Best SBA Lenders: Top 100 SBA Lenders— With more than 3,000 SBA lenders nationwide, choosing the best SBA lender can be difficult. Some of the best SBA lenders approve average loan amounts of about $75,000 to more than $1.5 million, with interest rates averaging around 6.4 percent to more than 9.2 percent. In this guide, we’ll show you the 100 top SBA lenders per current SBA data, and review 10 of the top SBA lenders. Once a loan is approved, how long will the funds be available? The funds will be available for 30 days, so a borrower will need to transfer the funds from his loan to his personal account within that period of time. If he fails to do so, his application will expire and he would need to apply again. Do clients need to provide their credit card number upon applying? Yes. Since LightStream’s lending platform is done online, they need the client’s credit card information to further verify his personal identity. The information given to them will not be stored in their system or shared with anyone. Not sure if LightStream is the right fit for you? Read our reviews of all top lenders or check out one of these three LightStream competitors.